Looking to revamp your design for your website or project? No one wants to see outdated content and material. Your customers are expecting to see modern designs that deliver impactful messages. 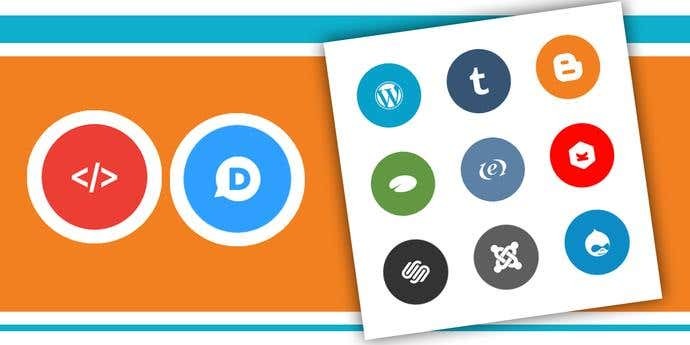 Thankfully, featuring contemporary social media icon sets in your latest projects can help engage your customers and bring your content to life. In modern 2016, social media icons are used everywhere. You’ll find them on company websites, blogs, business cards, digital flyers and even on online resumes and email signatures! 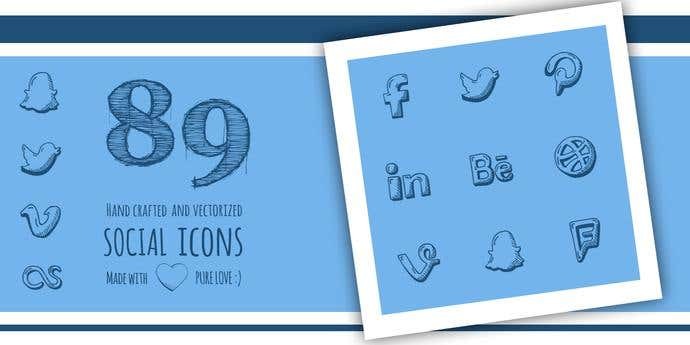 For some inspiration, we’ve provided a selection of the 40 most impactful social media icons to help you deliver the best modern designs. Best of all, they are free to use! This watercolor-style galaxy icon set designed by Every Little Polish adds a magical touch to any project. 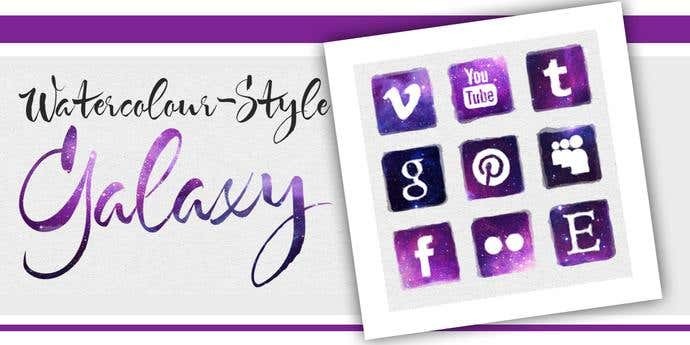 Each white social media symbol is clearly displayed against a purple starry sky background. This set of 15 icons is available at Deviant Art. 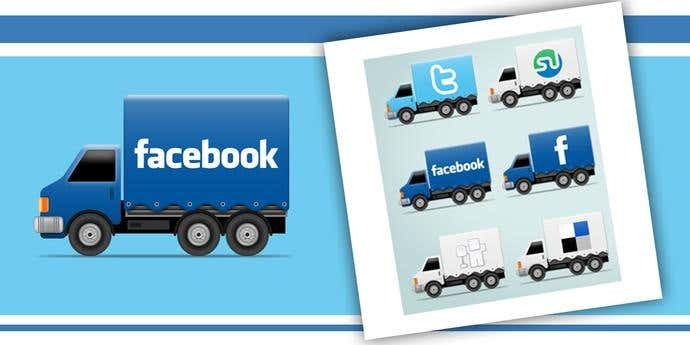 Designed by Andrea Austroni exclusively for Hongkiat.com, this social icon truck set consists of 10 social network icons, each featured boldly on the side of a truck. 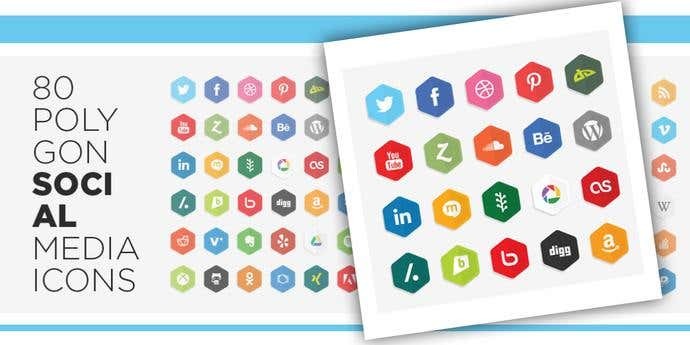 This smart icon set can be used to link users to your tweets, Facebook posts, and other social media platforms. Are you looking to promote environmental sustainability, gardening or growth for your website or project? 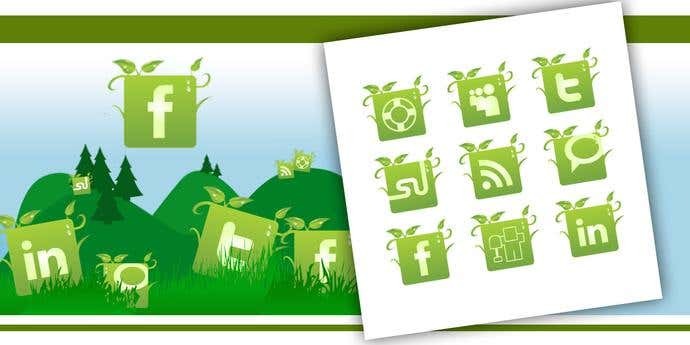 Designed by Visual Swirl, this set of 12 green social media icons features sprouting green leaves and branches. Each icon is available in four different sizes. This pack of 12 wood tile icons is designed by Chris Thurman and is available at Six Revisions. The burnt-wood base combined with the distinctive lettering makes this the perfect set for any grunge-styled website. 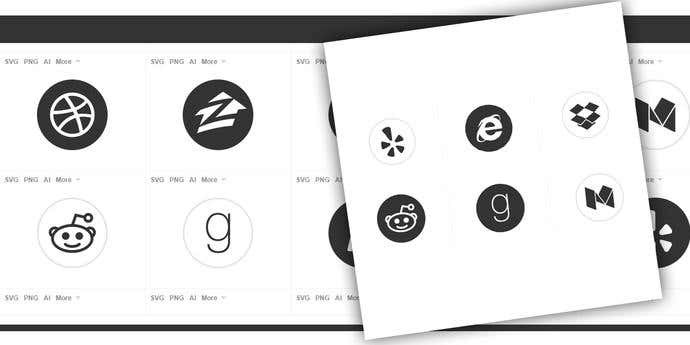 Each icon is delivered as a 420 x 420 px PNG file, but you can scale it down to any size that suits your needs. 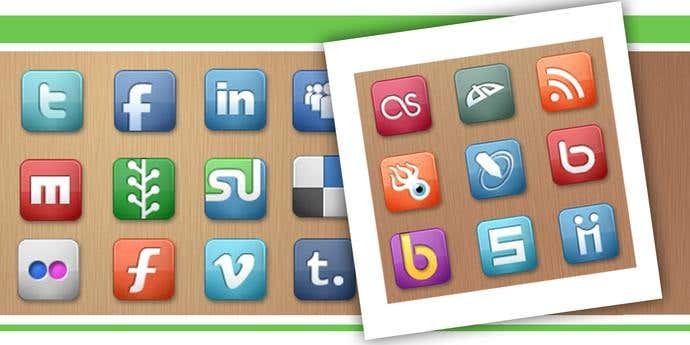 This fun icon set designed by Graphic Burger consists of 40 different social media icons. The set features white symbols against a brightly colored and squared background. The icons are available to download in four different sizes. Designed by Roberts Ozolins and available at Behance, this set of 24 social media graphics epitomizes the minimalistic look. The circular bordered icons feature muted hues from a classic grey palette. This set is ideal for IOS 7 devices. Designed by Joshua Sortino, this set of 12 provides simple and circular graphics with a choice of bold, modern colors. The distinct white social media symbols gives this icon set a contemporary feel. These icons feature a clean, versatile look that can be used on any site. Designed by Good Stuff Nonsense, this set consists of 89 hand-drawn vector icons. Each icon is available in two sizes and is downloadable in SVG and PNG formats. The hand-drawn graphics have a vintage and retro look, ideal for any creative project. 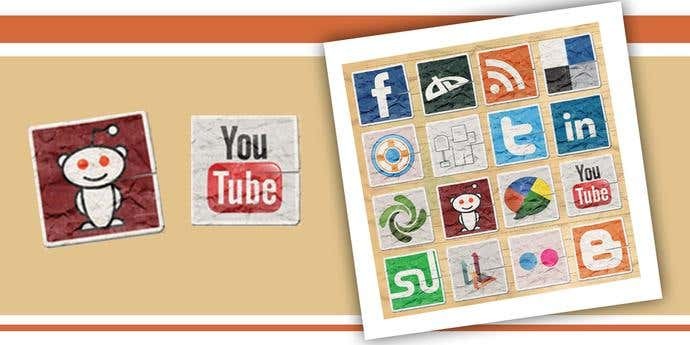 Designed by Lunar Pixel and available at Deviant Art, this set consists of 160 geometrically shaped social media icons. This bright colored set provides 80 polygonal shaped and 80 rounded square shaped graphics. If you are looking for minimalist and feminine social media graphics, you’ll love this set. 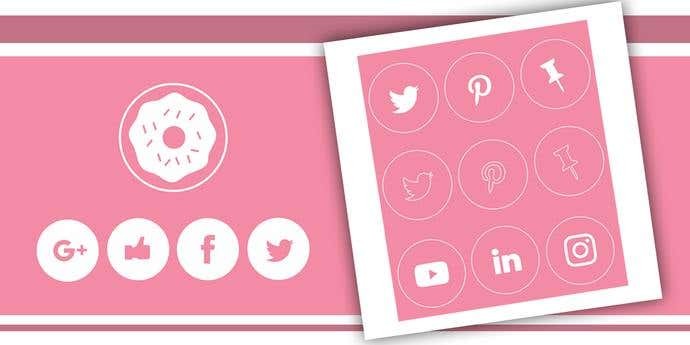 This soft pink set offered by Behance includes 9 of the most popular social media icons in 3 different color combinations. 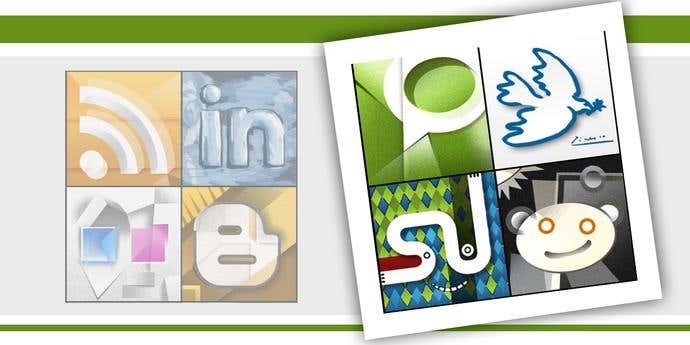 This quirky set of social media icons is designed by Peachpops and is available at Deviant Art. 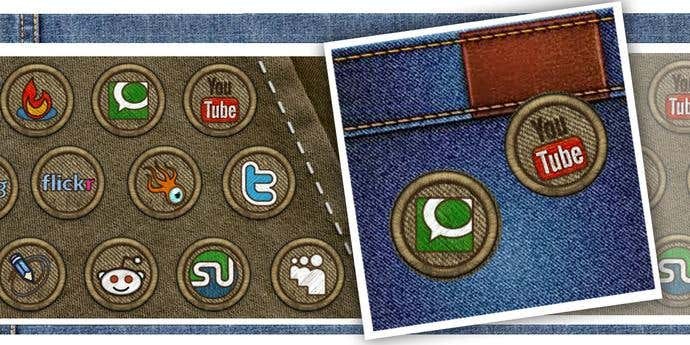 Each social media graphic resembles a traditional fabric badge and features a khaki background with saddle stitching. These are available in 3 sizes - 64 x 64 px, 128 x 128 px and 256 x 256 px. 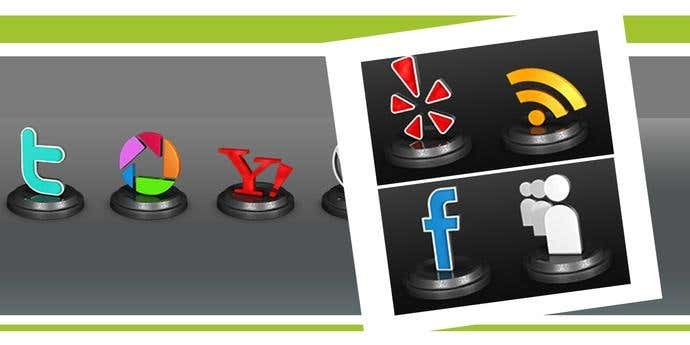 Designed by Web Resources Depot, these statuette social media bookmarking icons offer 3D symbols presented atop a disc platform. These trophy-like icons are available in various colors and large sizes but can be scaled down to your requirements. 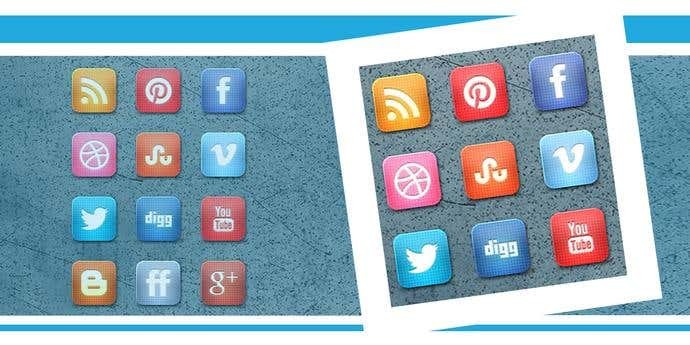 This set of 20 social media icons is designed by Dawghouse Design Studio and is available at Tutorial 9. Each icon features a slightly slanted and brightly colored 3D square tile. The clean lines and sleek look makes this set suitable for any website with a modern theme. 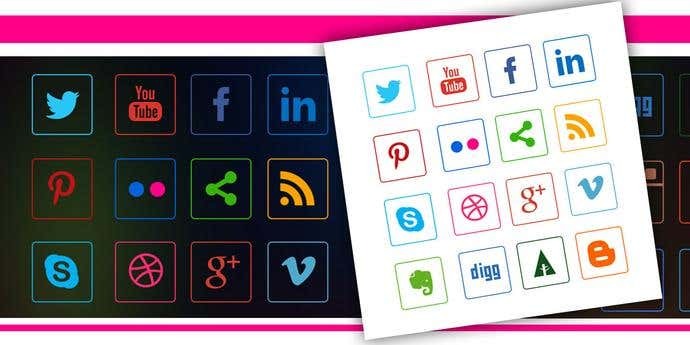 Designed by Vecteezy, this set of 12 social media icons is colorful, trendy and fun. 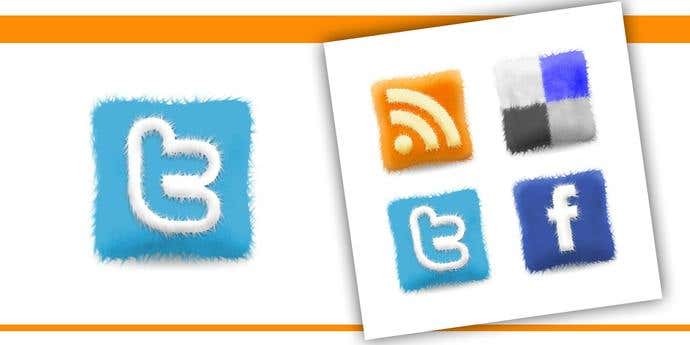 The icons feature white social media symbols against a brightly colored background. The circular sticker icons are curled at the side and feature a quirky ‘saddle-stitch’ style line frame, perfect for any quirky project. 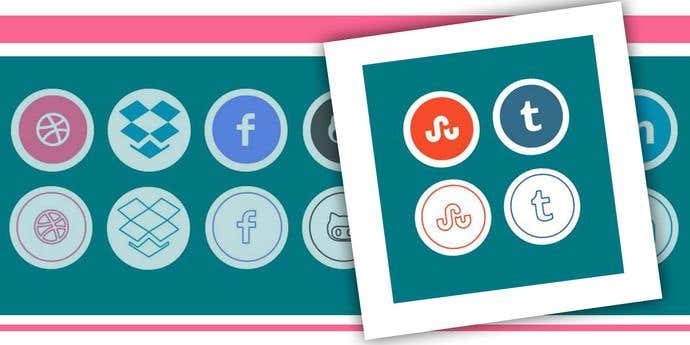 This flat set of round social media icons is designed by Lee Gargano and is available at Dribbble. The lines are flat, clean and contemporary so they can be used on any minimalistic site. These icons are available in PNG format. If you are looking for minimalistic social media icons with simple colors and clean straight lines, you’ll love this neat set designed by Umar Saleem and available at Dribbble. 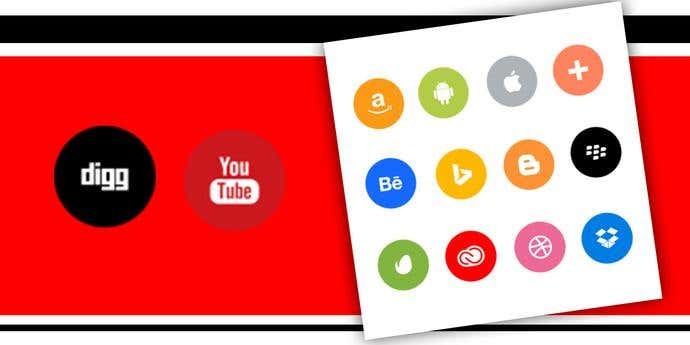 Each social media logo is set within a white circular border in a primary colored square, perfect for any simple project. Designed by Christo B, this set of 24 icons features white social media symbols against a dark black background. These circular icons offer a stark and dramatic effect, perfect for gaining your customer’s attention. 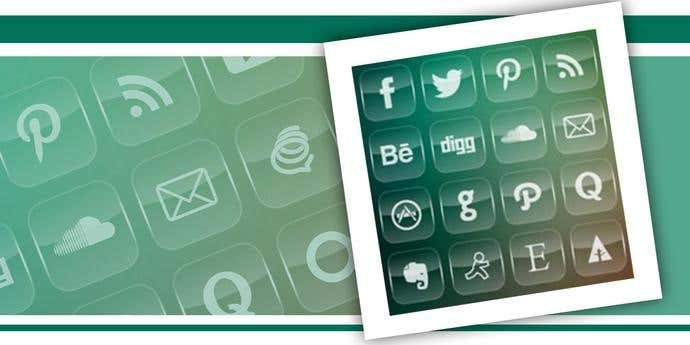 Designed by Graphics Fuel, this set features 48 social media icons. This set provides you with 24 colorful social media logos against a black background and another set of 24 against a clean white background. 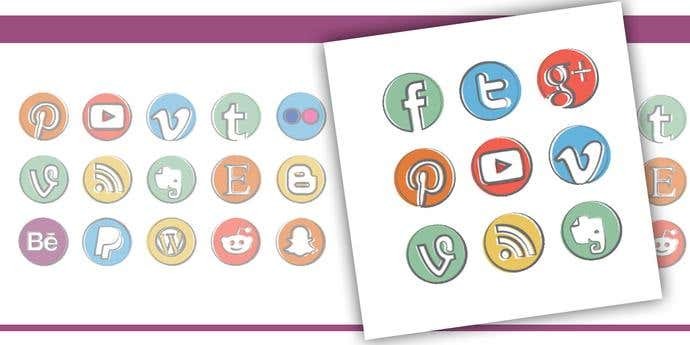 Designed by BestPsdFreebies and available at Graphic Burger, this set of 45 social media icons has a subtle and retro look. Each classic black symbol is displayed against a retro-colored square featuring rounded edges. The icons are built with Photoshop vector shapes so they can be easily resized and edited for your project. In this icon set, each graphic is designed to resemble a fluffy square cushion. 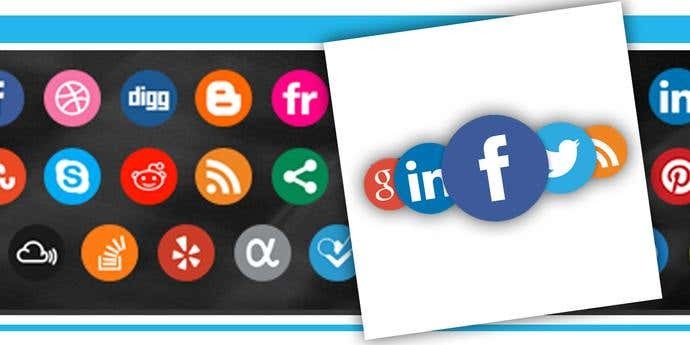 Designed by Andrea Austoni and available at Noupe, this set includes 6 transparent social media graphics in PNG for FaceBook, Twitter, LinkedIn, RSS, StumbleUpon and Delicious. Looking for a way to attract the attention of your readers? 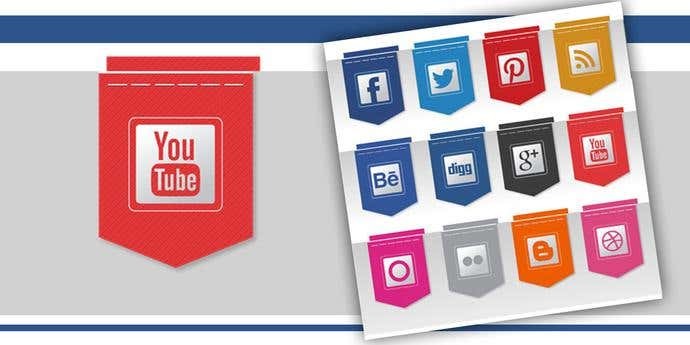 Check out this set of 18 social media icons featuring beautiful ribbons in attractive colors. Designed by Zee Que and available at Design Bolts, these ribbon social media graphics can be used on any dark or light colored website. 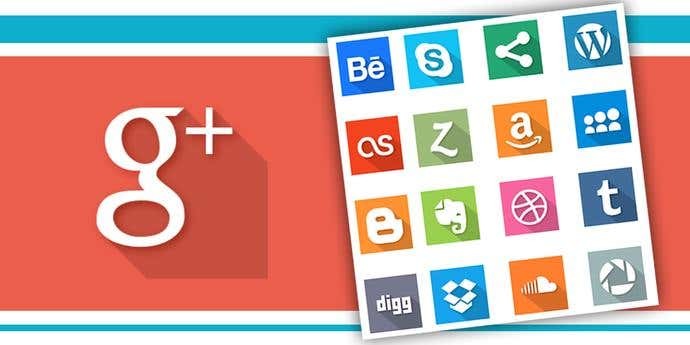 The retro look is unmistakable in this set of 20 social media symbols. This unique set of social media graphics is designed by Little Star Creative and available at Creative Market. Each circular logo has a retro twist and will grab the attention of any customer. 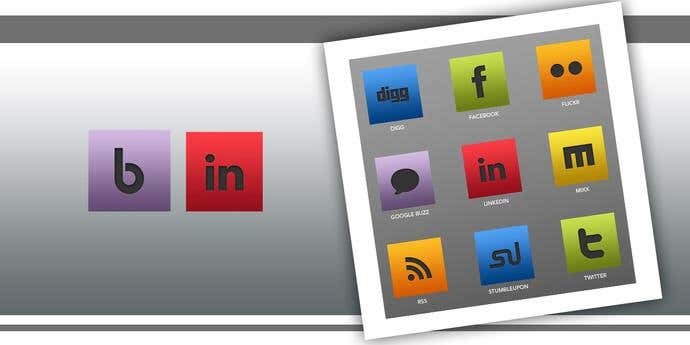 Looking for a social media icon set for your artistic website? These graphics are a unique set inspired by Pablo Picasso. The graphics are designed by Iconshock and range in size from 512px to 16px. This set of sleek social graphics is designed by Andrew S. Roberts. The set consists of 10 420px x 420px icons in PNG format. 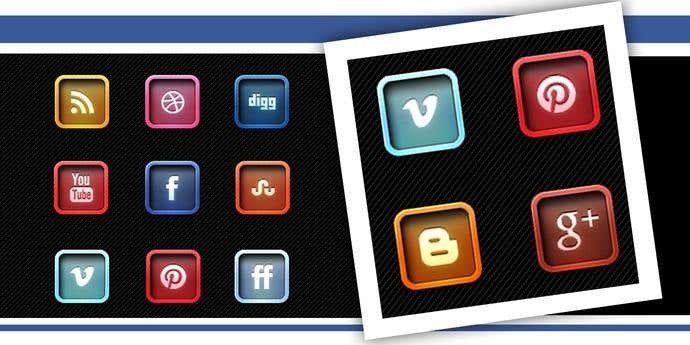 Each social media icon features 6 vibrant colors - orange, red, blue, green, purple and yellow. 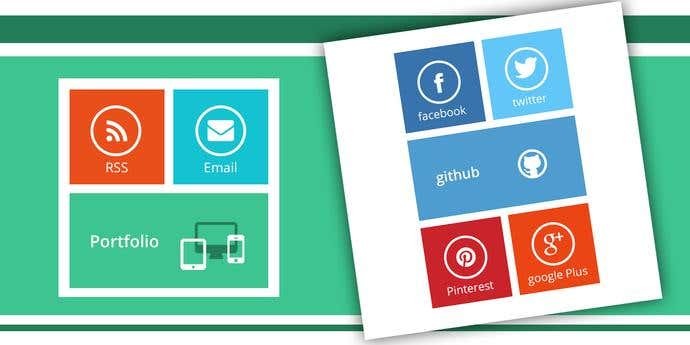 You can use the entire set of icons as one color to match your site’s design or mix them up to add color to your website. 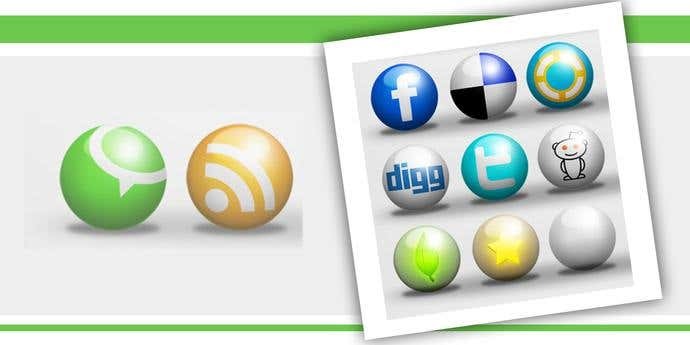 The freestyle set of social media graphics includes 28 icons provided in PNG format. Each icon is beautifully styled in three sizes - 24 x 24px, 48 x 48px and 60 x 60px. 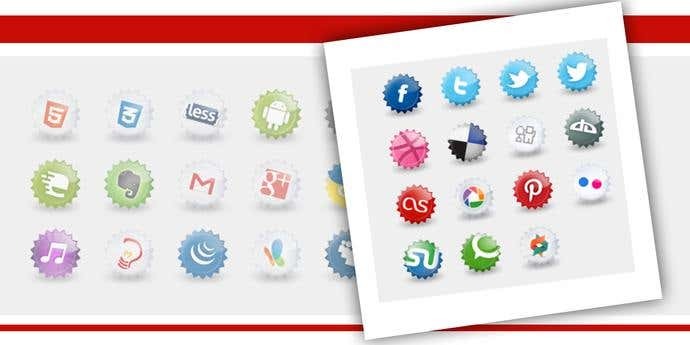 This charming set of social media icons is designed by Helen Gizi and is available at Speckyboy. This eye-catching vintage set was designed by Nicola Lazarevic exclusively for Webexpedition18. The creased effect in all 16 icons gives the set a distinctly vintage look. Each icon is sized at 256 x 256 px or 128 x 128px and is downloadable in PNG format. 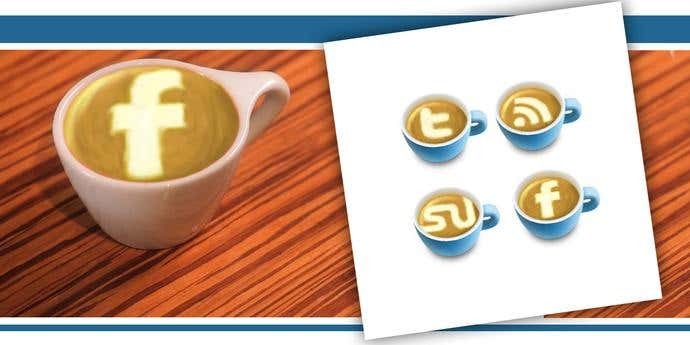 Coffee lovers will love this latte art inspired social media set designed by Cute Little Factory. It’s a small little set of 4 icons but a must-have for cafe businesses. Each graphic highlights a social media symbol by providing a warm background as a contrast. 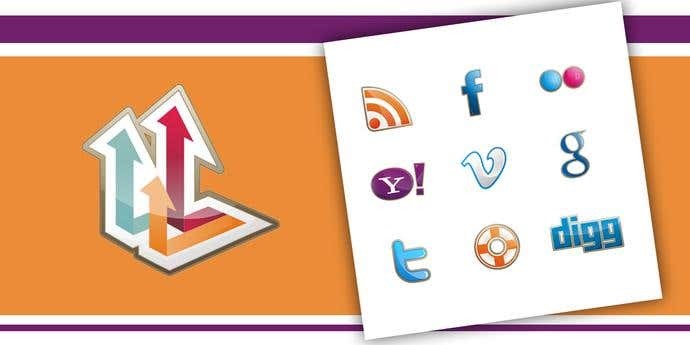 This set of 30 social media graphics was designed by Web Hosting Secrets Revealed. Each social media symbol is displayed against a brightly colored flat leaf design. The icons are provided in 256px x 256px in size and are available in PNG, PSD, ICNS and ICO formats. These flat leafed social media graphics work great with both bright and dark colored backgrounds. 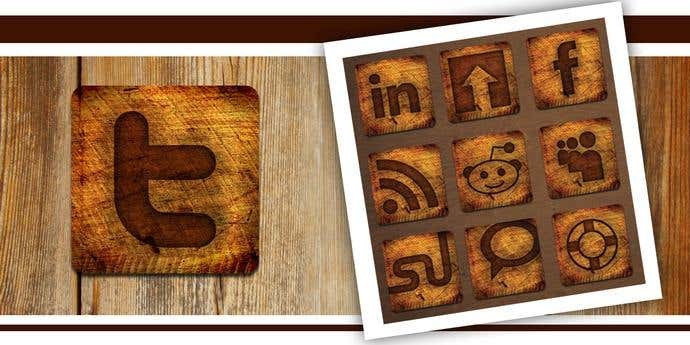 The Somacro set of social media icons is designed by Tina Mailhot-Roberge and is available at Deviant Art. 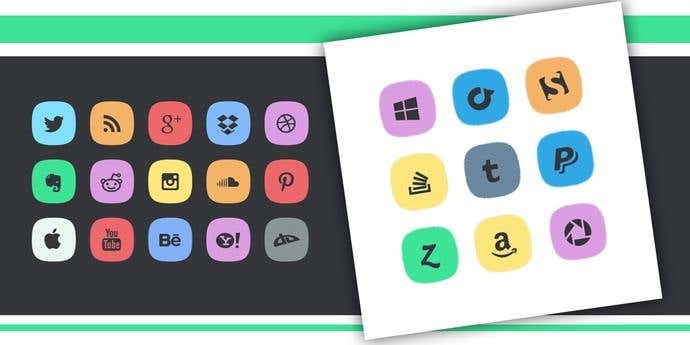 The set consists of 45 large and simple colorful social media icons. Each circular icon is 500 x 500 pixels and is downloadable in PNG format. 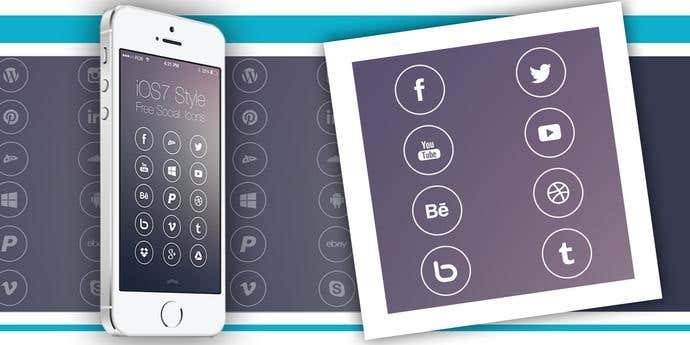 Created by Zee Que and available at Design Bolts, this set consists of 40 transparent social media graphics. The set draws upon a cool green palette and is perfectly designed for any modern website. These graphics are available in seven sizes - from 48px to 512px. This set consists of 21 colorful bevelled icons and provides a 3-dimensional look that will attract any user. The bevelled social media graphics are designed by Yaruno and are available at Deviant Art. Designed by Creative Nerds, this small set of 12 letter-pressed icons packs a mighty punch with its vibrant colors and rounded corners. Each high-quality graphic measures 75 x 75px, the ideal size for any digital design project. The bottle cap shape of this set gives these social media icons a fun and youthful look. 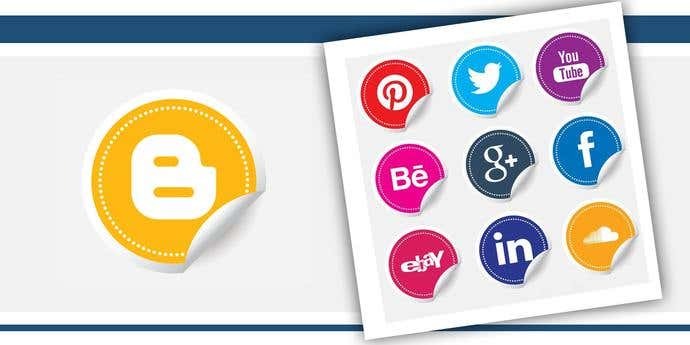 Designed by Plugo Labs, the Bottle Cap social media icons is available for download in 3 sizes - 32x32px, 48x48px and 64x64px. 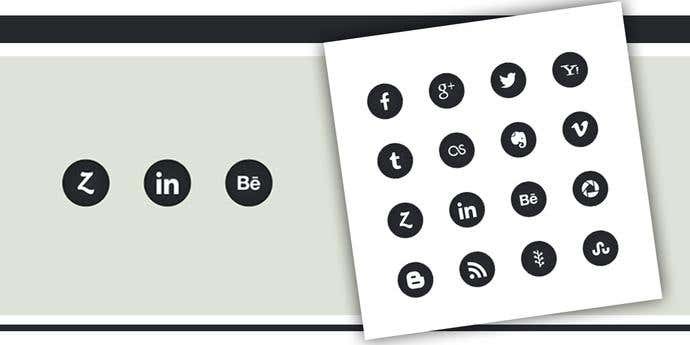 This set of 12 metal plate social media graphics is designed by Creative Nerds. The metallic look of the symbols gives them a sleek, classy and professional look. 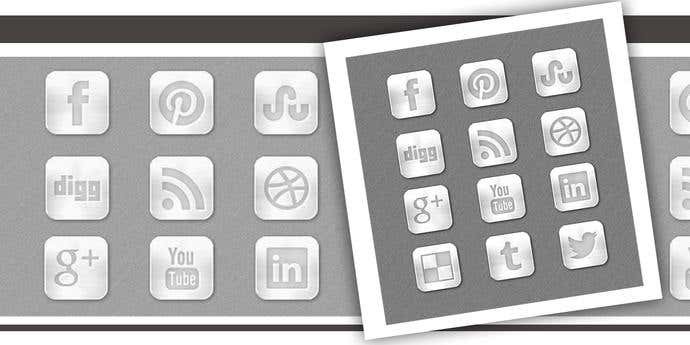 Each dark grey social media symbol appears ‘etched’ into a square silver-colored metal plate with rounded corners. 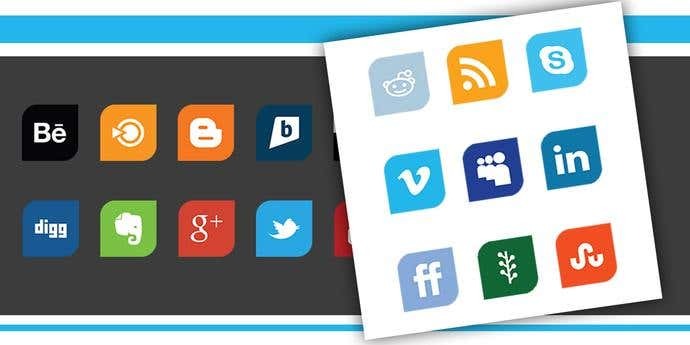 This set of 14 social media icons is beautiful and eye-catching in its simplicity. There are two versions of each icon - one opaque and one transparent. You can choose to use any version depending on the effect you want to achieve. Designed by Aatif Khan, these icons are available in PNG format. Designed by Yahya12 and available at Deviant Art, this set consists of 15 social media graphics. Each symbol features a metallic colored ball with the social media logo presented on the surface. The icons are available in ICO and PNG formats and in 4 sizes - 32 x 32 px, 64 x 64px, 128 x 128px and 256 x 256 px. 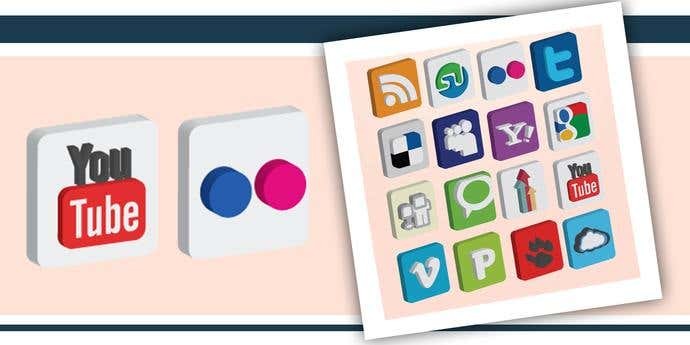 This set of 43 elegant social icons is designed by Nick Roach, founder of Elegant Themes. With their neat lines and a fabulous selection of vibrant colors, these 64 x 64px sized social media icons embody elegance, beauty and style. Available in PNG and PSD formats, these graphics will add a touch of class to any website. Designed by Kaswar Ali and available at Design Reviver, the Scribble social icon set is perfect for anyone looking to revamp their site and give it a fresh new look. 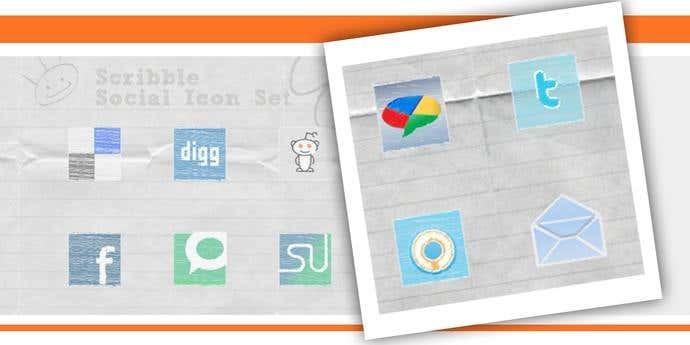 The 12 social media icons have a fun and funky look with their ‘scribbled’ symbols featured against a crayon-colored background. These are available in PNG format in 4 sizes, 32 x 32, 48 x 48, 64 x 64 and 128 x 128. If you are looking for a black and white social media set that looks professional without looking too plain, you’ll absolutely love this Classic Black and White set designed by Alfredo. There are two versions of each icon - one features a white symbol against a black background and the second features a black symbol against a white background. 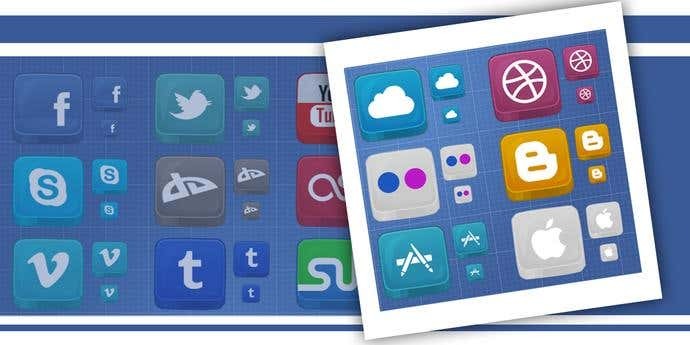 Designed by Creative Nerds, this set includes 12 icons for 12 of the most popular social media sites. Each social media graphic features a white symbol against a colored grid background. These icons are available in 64 x 64px size, ideal for most web projects. Are you looking for a graphic designer for your next project? By posting a project on Freelancer, you’ll have access to expert talent specialized in website design, mobile app design, logo design and icon design. Simply specify your project requirements, post a project and receive bids from our experts in just seconds!